An invaluable asset to prayer groups, retreats, Christian education programs and other gatherings of the faithful. 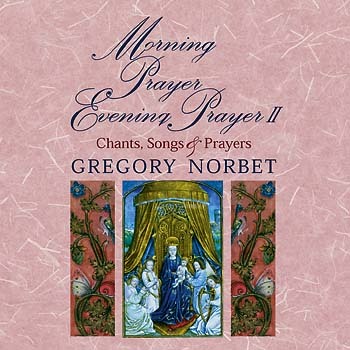 This accompaniment features guitar, keyboard, vocal, and other instrument parts for the album Morning Prayer, Evening Prayer II by Gregory Norbet. This 32-track CD by Gregory Norbet features chants, songs and prayers for prayer groups, retreats, Christian education programs and other faithful gatherings. This 32-track MP3 album by Gregory Norbet features chants, songs and prayers for prayer groups, retreats, Christian education programs and other faithful gatherings. This accompanying Meditation Book contains verses, reflections and space for you to write your own prayers and contemplations. Morning Prayer, Evening Prayer II will transport you to that place of reverent solitude you are seeking. Melodic birdsong and resonant music will drown out the clamor of everyday concerns. Gregory's soothing voice will direct your thoughts toward prayer and your spiritual eyes toward God. The recordings contain 32 different chants, songs, readings and prayers that can be an invaluable asset to prayer groups, retreats, Christian education programs and other gatherings of the faithful. Like Morning Prayer, Evening Prayer, this second volume is comprised of spoken prayers and meditations interspersed with choral music sung in the ancient format of the Liturgy of the Hours. Its soothing arrangements feature piano, flute, oboe, English horn and cello. The accompanying Meditation Book contains verses, reflections and space for you to write your own prayers and contemplations, while the guitar songbook includes harmonies, solo instrument parts and guitar chords above the staff.